First |b we describe the isolation of three new diterpenoids with a hydroazulene skeleton |b dictyotriol C(1) D(2) |b and E(3). as well as the previously known pachydictyol A(4) dictyol B(5) dictyol C(6) and dictyotadiol(7) from a Dictyota sp. 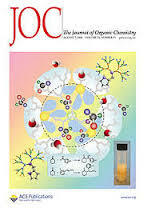 The structures of the new diterpenoids 1-3 were proposed on the basis of their spectral data and confirmed by chemical transformation of dictyol B(5). This is followed by absolute stereochemistries of the new compounds as well as that of the known dictyol B(5) and dictyotadiol (7) were determined. These absolute configurations were opposite to that reported for pachydictyol A(4). Vázquez, J, “Structure of Hydroazulenoid Diterpenes from a Marine Alga and Their Absolute Configuration Based on Circular Dichroism,” RIQUIM - Repositorio Institucional de la Facultad de Química - UdelaR, accessed April 22, 2019, http://riquim.fq.edu.uy/items/show/4469.